The young Rebels, 12 years ago, had 11 points to spare against Limerick but were caught cold by Galway at the All-Ireland semi-final. Ring doesn’t want history repeating itself and he’ll be conscious of the break between now and August 13. Cork minor hurlers celebrating their victory over Clare in the Electric Ireland Munster MHC final in Thurles. Video by Denis Minihane. 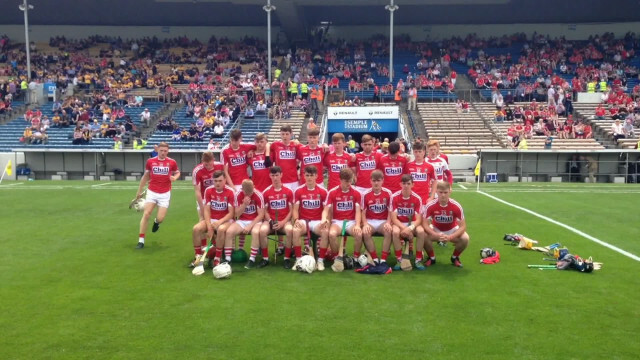 This might have been Cork’s third game in 11 days but they looked fresh and hungry. Momentum’s a great thing and Ring will hope that it doesn’t stall over the next five weeks. Cork were excellent as they dismissed Clare by 17 points, claiming a 33rd title in this grade. And it was clear that two titanic semi-final clashes with Tipperary had stood to his young stars. Cork’s imperious minor display set the tone for a day of double-delight, as the seniors followed suit against Clare. Sheehan grabbed the headlines with his scoring haul, and he netted in the 17th and 21st minutes to help propel Cork into a 2-11 to 0-7 interval lead. His first goal was knocked home on the rebound, after Clare goalkeeper Eamon Foudy had pulled off an excellent save, but his second was a picture-book effort. Sheehan danced across the 20m line, flicking the ball impudently over the head of a Clare defender before collecting it on the way down. He flashed a low drive past Foudy into the goalkeeper’s bottom left-hand corner, and Cork had a 2-6 to 0-4 lead. Clare struggled to cope and while Tiarnán Agnew kept them ticking over with placed balls in the first half, the Banner boys were overrun. Killian McDermott scored three points for Clare after coming off the bench but Cork had big displays from Sheehan, dynamic midfielder Daire Connery, and skipper Sean O’Leary Hayes. Cork’s third goal arrived 19 minutes from time, as sub Barry Murphy latched onto Liam O’Shea’s cross-field ball before finishing well. Robert Downey put the icing on the cake in stoppage time, profiting from Murphy’s long ball to collect Cork’s fourth goal. Scorers for Clare:T Agnew 0-7 (6f), K McDermott 0-3, C Minogue 0-2 (1f), D Ryan, A McCarthy (f), K White, R Considine 0-1 each. CORK: G Collins; C O’Callaghan, S O’Leary Hayes, E Roche; A Walsh Barry, J Keating, G Millerick; B Roche, D Connery; D Lenihan, C Hanafin, E Sheehan; B Turnbull, R Downey, L O’Shea. Subs: B Murphy for Lenihan (h.t. ), D Hanlon for Hanafin (48), R Howell for Walsh Barry (48), B Buckley for O’Shea (52), D Jones for B Roche (57). CLARE:E Foudy; B Higgins, R Hayes, C McInerney; C Minogue, D Ryan, A McCarthy; K White, L Brack; T Agnew, R Considine, E Fitzgerald; G Cooney, C Tierney, B Horner. Subs:K McDermott for Brack (h.t. ), C Haugh for Considine (35), G Cahill for Fitzgerald (39), P Corry for Horner (46).